Editor/Author Jakeman, A. J., Barreteau, O. and Hunt, R. J. et.al. 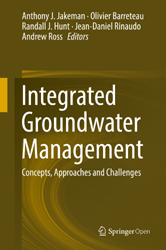 The aim of this book is to document for the first time the dimensions and requirements of effective integrated groundwater management (IGM). Groundwater management is a formidable challenge, one that remains one of humanity's foremost priorities. It has become a largely non-renewable resource that is over exploited in many parts of the world. In the 21st century, the issue moves from how to simply obtain the water we need to how we manage it sustainably for future generations, future economies, and future ecosystems.